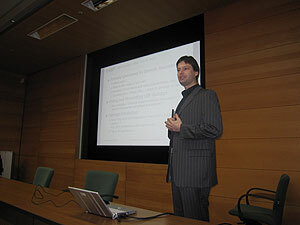 Lecture presentation by Dr. Andreas Nicolai. On January 26 (Tuesday), the above workshop was held at National Research Institute for Cultural Properties, Tokyo. Professor Grünewald of the Dresden University of Technology and Dr. Kikkawa of the Institute gave a lecture on an environmental assessment of a library and a simulation analysis concerning the risk of mold occurrence. Dr. Nicolai of the same university gave a lecture on the modeling and numeric analysis of salt movement and phase changes inside unsaturated porous building components. Dr. Plägge of the same university gave a lecture on methods for measuring the moisture characteristics of building components. This workshop comprehensively covered analytical approaches for environmental analysis, methods for measuring the building component moisture characteristics necessary for analysis, and presented a case example for when analysis is adopted for an actual building. A vigorous exchange of opinions was made possible through this event.